As Beatle fans we know quite a bit about the Beatles terrible experience in Manila, but a lot of what exactly happened there is clouded in half-truths and mystery. I have been reading a lot of interviews and news stories to piece together what happened. 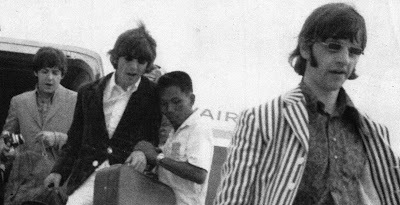 The Beatles arrived at the Manila International Airport on July 3, 1966. There were well over 1,000 fans waiting to great them, but they didn't get to see them because the Beatles' plane did not land close to the fans. As soon as they stepped off the plane, they faced a problem in Manila. As you will notice in just about any photograph of the Beatles on the steps of an airplane, each guy has his own briefcase. Inside of that brief case was personal items as well as marijuana. The way things typically worked was that the Beatles exited the plane and get right into the waiting car that would take them to the hotel or venue. They would have those brief cases with them in the car while the entourage would go inside the airport and go through customs. No one would ever examine the cases. But things were different in Manila. As soon as they stepped onto the stairwell, Atty. Salvador Mascardo demanded that they hand over their bags. The Beatles were herded into the waiting limo by the police forces and Neil Aspinall managed to sneak the cases into the truck before it took off. The Beatles were taken to Philippine Navy headquarters for a press conference. 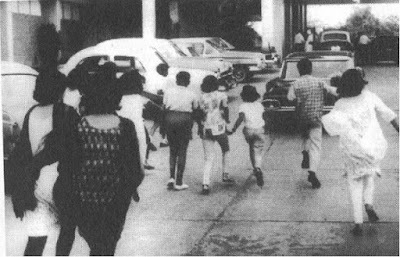 Meanwhile disappointed fans were chasing after the Beatles' limo---some got close enough to kiss the car they were in.